This month we spoke to Leslie Kennedy, a Salesforce Certified Administrator and Sales Manager located in Boston, USA. 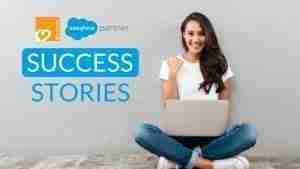 Leslie signed up for our online Salesforce ADM201 course. I have many years experience in Customer Service/Sales Management, managing a variety of teams with upwards of 60 reports 24/7, to four Inside Sales team members. In those roles, I was very focused on process even before we had CRM tools to build it! I have been involved in several implementations as an SME, user, and manager and have worked across several industries including; Technology, educational publishing, environment, and pharmaceuticals. I met our local K2 representative at the Boston Salesforce World Tour and liked her right away. Even though I wasn’t looking to change positions, I did want to gain my Salesforce Administrator certification. She was very persistent, although in a proactive way – constantly keeping in touch and overtime seemed to sense when I was ready. Before taking the course though I did have some hesitations. Having taken a course through SFDC a couple of years earlier which turned out to not be great preparation for the exam, so I was sceptical. My K2 representative convinced me it would be a great class that would absolutely prepare me with everything I would need to know, and she was right! The course was just what I needed to keep me motivated and within two weeks of the course, I passed! The other factor I appreciated was knowing the instructor was compensated for everyone who passes….so I sort of wanted to pass for him too, not just me. Clearly, it’s a motivational factor for them, which I think is great. I took the Salesforce ADM201. Although I was a bit concerned to start with when I learned the instructor would be based in another country. I wondered if I would have issues with his accent while trying to keep up and learn some complex concepts but after the first thirty minutes or so, I felt much more confident because he was doing a wonderful job. We had one class with where the connection was a problem but he did a great job of compensating and it all worked out in the end. Personally, having achieved a goal I’d wanted to do for several years gave me a new confidence. I am still in my current role, but looking for a new challenge. I can see that having the certification increases your credibility and employability so I hope to use it to find a new role where I can start using my knowledge to shape processes and make a difference for the types of teams I’ve managed for so many years. My new challenge will hopefully be as a Business Analyst; driving change and reshaping how teams function. So, a bit less on the day-to-day managing of those teams. I do think I will be very successful in this type of role and can do more than when I was a Sales Manager. 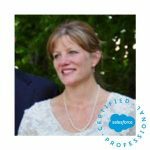 Leslie Kennedy, Salesforce Certified Administrator and Sales Manager from Boston, USA.